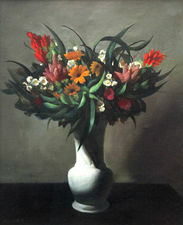 Adriaan Johannes van’t Hoff (1893-1939) - painter, watercolour, graphic and poster artist. Well known Dutch Arts and Crafts artist. Famous and loved for his travel Posters and drawings and etchings of animals, particularly birds. Van't Hoff studied in the Academy of Figurative Art in the Hague (Netherlands) and became one of the best loved and famed artists in the beginning of the 20th century. His work strongly influenced by Art Deco and Jugendstil motifs.